ANTLERMAX® PELLETS, PATENTED ENERGY NUGGET, CRACKED AND WHOLE GRAINS - For development of improved antler size and mass. 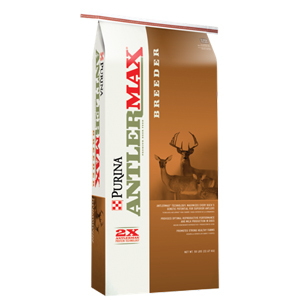 Provides for a intake of high-quality proteins including AntlerMax® By-Pass Protein technology that deliver high concentrations of amino acids needed by the growing antler. Helps develop deer with exceptional body size. High-quality protein helps build muscle for improved body growth. HIGH FAT CONTENT - 6.5% fat from several high- quality vegetable oil sources including a patented high energy nugget that helps deliver a high percent of fat directly to the growing tissues. Helps deer regain body condition quickly. ENHANCED LEVELS OF VITAMINS AND MINERALS - Helps promote antler growth, density and strength. Enhanced levels of calcium, phosphorous, magnesium and vitamin D. Contains proprietary AntlerMax® Mineral Technology including organic trace minerals for replenishing depleted bone material stores used during antler mineralization. TASCO® DRIED KELP - Excellent source of iodine and other minerals. Research done with several livestock species has shown that body temperature is lower in animals fed TASCO®. May help maintain feed intake during periods of heat stress. DIAMOND V® YEAST - Help improve feed intake and digestibility – Diamond V has conducted research with deer that demonstrates that under some conditions feed intake and forage digestibility were improved with the addition of Diamond V® Yeast. OLIGOSACCHARIDES - Commonly called Prebiotics, they support the growth of beneficial bacteria in the colon and improve gut health. OCTACOSONAL - Excellent source of tocopherols and other antioxidants. Research in other species has shown that octacosonal helps oxygen to be utilized more efficiently.